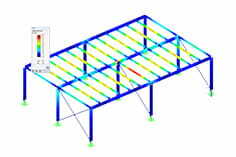 The steel columns displayed in Figure 1 are subjected to specific loads, and their flexural buckling in the plane is to be analyzed. All the cross-sections used are square hollow sections. 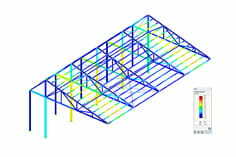 The aim is to come to a conclusion in terms of efficiency and to examine the application of higher steel strengths. All three columns are capable of bearing the specified load. The second column has larger external dimensions, but is slender with regard to the cross-section dimensions. Therefore, 7% of the sheet width is ineffective due to the local buckling. However, the larger external dimensions have a positive effect on the critical load Ncr. As a result, this column has a more favorable slenderness ratio for flexural buckling. In the case of the second column, about 7.5% of the cross-sectional area can be saved compared to the first column which has the same steel grade. In the case of the third column, about 18% of the cross-sectional area can still be reduced compared to the second column. The smaller dimensions have a negative effect on the critical load. About 10% of the cross-sectional area is also ineffective due to the local buckling. The slenderness ratio of this column is significantly worse than in the case of the other columns. However, the design is ultimately fulfilled.